OOKALA, Hawaii — Big Island Dairy, the largest of two dairies in the State of Hawaii, held an open house on Monday to showcase advances the dairy has accomplished since changing ownership in December 2012. Gov. Neil Abercrombie, Hawaii Department of Agriculture Chairperson Scott Enright and about 50 other industry and community members took the opportunity to explore the dairy’s operations first-hand in Ookala. Dairy owners Steven and Derek Whitesides, father and son respectively, have put their 40 years of dairy experience into modernizing the 2,500-acre Big Island Dairy. A state-of-the art milking facility accommodates a herd of nearly 2,000 milking cows, which produce about 6,500 gallons of milk per day. To help offset the high cost of importing feed, the dairy is currently farming 350 acres of corn and maintains 1,500 acres of pasture. In addition, they farm another 160 acres of corn in a separate location 20 miles away from the dairy and plan to raise other crops such as forage oats, soybeans and alfalfa. The dairy also uses modern technology and methods to address environmental concerns, such as waste disposal, wastewater and run-off management. Presently, the only other commercial dairy in the state is Clover Leaf Dairy, also on Hawaii Island and operated by Ed Boteilho, who was also present at the event. Big Island Dairy’s milking facilities are state-of-the-art and processes about 6,500 gallons of milk each day. 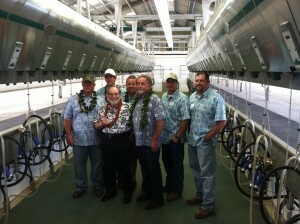 The Governor and HDOA Chair toured the facility with the owners and managers of Big Island Dairy.